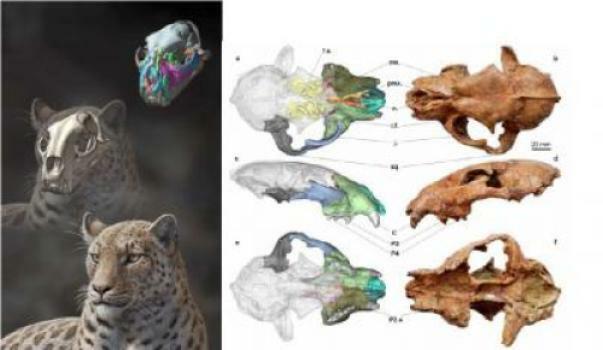 Caption: At left is: Life reconstruction of Panthera blytheae based on skull CT data; illustrated by Mauricio Antón. At Right are images of the holotype specimen and reconstructed facial bones based on CT data; Figure 1 from the paper. The oldest big cat fossil ever found – which fills in a significant gap in the fossil record – was discovered on a paleontological dig in Tibet, scientists announced today. A skull from the new species, named Panthera blytheae, was excavated and described by a team led by Jack Tseng – a PhD student at the USC Dornsife College of Letters, Arts and Sciences at the time of the discovery, and now a postdoctoral fellow at the American Museum of Natural History (AMNH) in New York. “This find suggests that big cats have a deeper evolutionary origin than previously suspected,” Tseng said. DNA evidence suggests that the so-called “big cats” – the Pantherinae subfamily, including lions, jaguars, tigers, leopards, snow leopards, and clouded leopards – diverged from their nearest evolutionary cousins, Felinae (which includes cougars, lynxes, and domestic cats), about 6.37 million years ago. However, the oldest fossils of big cats previously found are tooth fragments uncovered at Laetoli in Tanzania (the famed hominin site excavated by Mary Leakey in the 1970s), dating to just 3.6 million years ago. Using magnetostratigraphy – dating fossils based on the distinctive patterns of reversals in the Earth’s magnetic field, which are recorded in layers of rock – Tseng and his team were able to estimate the age of the skull at between 4.10 and 5.95 million years old. Incredible between 4 and 6 million years old. So was that before…or after it got off the ark? (Ha!) This magnetostratigraphy dating method must be an amazing tool for paleobiology. What I am reading here is this big cat discovery, puts big cats at or very near the estimated DNA based evidence split, between the two groups of cats, and…this new cat fossil out dates the previously oldest known big cat fossil by .5 to 2.5 million years. There is more: In addition, recent estimates suggested that species within the genus Panthera (lions, tigers, leopards, jaguars, and snow leopards) did not diversify until 3.72 million years ago – which the new find disproves. I’d say this discovery sets that estimate back a few years. All in all really cool discovery, and it’s stuff like this that keeps me glued to the internet as much as I can get away with. This entry was tagged New Discovery, Oldest Known Big Cat Fossil, Science, Technology. Bookmark the permalink.